When you’re planning a vacation, worrying about your house is unlikely to make the list of “Top Ten Things I Want To Do.” Fortunately, you can free up your precious time off for fun stuff like sightseeing, dining out, romancing, and relaxing ... yet still keep your home in great shape while you’re away. Just follow our handy guide. Turn off the water supply to your washer. Better yet, turn off the water supply to your entire house. A failed washing machine hose or a burst water pipe can quickly and quietly cause thousands of dollars’ worth of damage during your absence. Stop your mail for the duration. Envelopes piling up in the mailbox are a sure sign no one’s home. That’s like putting out a welcome mat for would-be intruders. USPS will hold your mail up to 30 days while you’re away … and you can notify them as much as a month in advance or at the last minute (as late as 3:00 the morning you want delivery suspended). Put a temporary hold on newspaper delivery too. If you still subscribe to a print newspaper, let your delivery service know the dates it will not be needed. Create the illusion someone’s home. Another break-in deterrent is a house that appears occupied. Set up lights and a radio to turn on and off using a timer. A digital timer with battery backup will protect you even when there’s a power outage. Adjust your thermostat. Leave your A/C on to dehumidify and prevent mold growth, but set the thermostat higher than usual for energy efficiency. About seventy-nine degrees should do the trick. If you have a programmable thermostat, make sure it will lower the temperature a couple of hours before your return. Leave the house (relatively) clean. Wait, what! When you’re busy packing, who wants to pick up a broom? You will come home eventually, though, and when you do, you don’t want that post-vacation glow to turn into gloom. A major overhaul isn’t necessary; just make sure your house feels like a pleasant place to return to. BONUS POINTS: Change the sheets so you’ll sleep in a fresh clean bed your first night home. Take out the garbage. This will keep your home smelling sweet and discourage mice, houseflies, and other pests. If HOA regulations only allow putting out garbage on certain days of the week – not the day you’ll be traveling -- wrap the garbage well and stash it in your freezer. Be sure to label the package carefully! Close and lock all windows and doors. This low-tech tip is still very effective. A wannabe burglar is usually looking for a house with easy access; locking up will make your home a much less tempting target. Don’t forget that one particularly vulnerable spot -- the entrance door from your attached garage. Inform your alarm company. 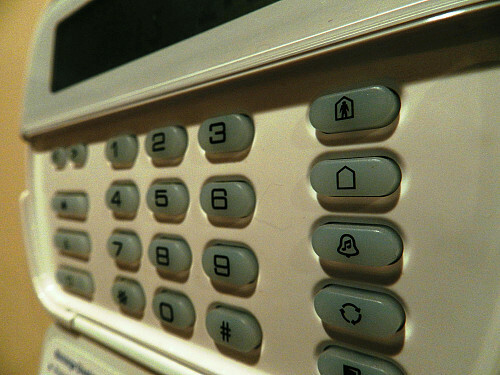 Activate your alarm system before you leave for the airport. In addition, alert your home alarm company so that they can be extra-watchful. If you’ve listed backup contact people, make sure they’re made aware of your plans as well. Remember to inform your plant- or pet-sitter of the entry code. Unplug. Disconnect electronic devices (television, PCs, game consoles, and the like – even your microwave!) or switch off their power strip to minimize “phantom energy” use. Besides protecting expensive electronics against power surges, this simple action can cut your electric bill by as much as 10-15 percent. The money saved means more for you to spend on souvenirs. Stay in touch. Protect your home even when you’re on the other side of the globe. Hooking up to a smart house system allows you to monitor your residence via your mobile phone. Get immediate alerts when the system detects dangers such as noise, motion, fire, flooding, or carbon monoxide.